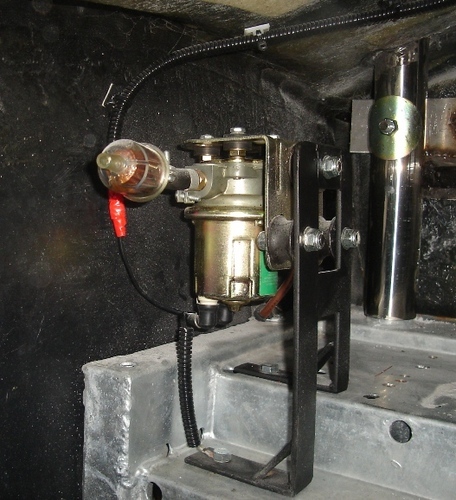 Fuel Pumps - you will need to choose a fuel pump suitable for your engine fuelling system. Typically with running RV8 3.5l (carb not EFI) people seem to go for electric Facet red top pumps or Carter, both are good pumps. Some people report that the Carters can be a little more noisy than the facets, but both are fine and once the engine is started you won't hear any fuel pump. Typically the fuel pump if positioned in the boot next to the tank, this keeps the noise down and keeps it away from the hot engine bay. There are many ways to mount the fuel pump, ideally you don't want it in the main boot area of it may be bumped when you put things in and out of the boot or your tool box sliding around. The photo below shows one solution (fuel tank removed), to make up a stepped bracket to allow it to be mounted as near to the back of the car as possible for easy access but up and out the way. This one is a carter and is mounted on additional rubber bobbins to stop vibrations. Note also that the fuel filter is before the pump to protect the pump from any bits left in the tank. The Edelbrock carb is a very popular choice of carburettor and is suitable for all the common sizes of Rover V8 engine that are likely to be fitted to a Sumo. The ‘Eddy 500’ seems to suffer less tuning issues than any of the equivalent Holley carburettors. 1.The float height. Even straight out of the box the float heights do not seem to be setup very well. The Edelbrock website has a PDF file that shows how to set the floats up. A set of torx drivers are required to remove the top off the carb. Be very careful not to lose the tiny spring clips that hold the accelerator pump arm and choke arm in place. Do not be afraid the ‘lift the lid’ off the carb, they are very easy to work on and components won’t come flying out of it never to be seen again! It’s best to remove the metering rods before the top is refitted. Remove the air filter stud before lifting the lid off the carburettor; it will rip the gasket if you leave it in place! If you do not know the BHP figure for your engine you can estimate it. A standard 3.5 SD1 will make about 155 BHP. A tuned 3.5 may make 230 BHP. A standard 3.5 with the higher CR of 9.75:1 along with a performer 180 manifold and the 500 carburettor might make about 180 BHP. A stock 4.6 might make around 250 BHP and a fairly highly tuned one about 320 BHP. Using the formula it can be seen that a tuned 4.6 engine will need 1504cc of fuel per minute when it’s running at WOT. Really, in this situation an ideal pump would be one that delivers at least 2 litres of fuel per minute. The original cobra’s sometimes used two or three pumps connected up in parallel in order to deliver enough fuel to the gas guzzling Ford big block! 3.Fuel Pressure. The fuel pressure is not the same as the fuel flow, the PDF doc that is downloadable from the Edelbrock website states what the maximum pressure can be before the carb will flood. (Around 6.0 PSI). The manufacturer of your pump will give the max PSI that the pump can deliver, if this value is too high another pump will have to be used or a regulator fitted. There is one other method that could be used to reduce the pressure. This involves the use of a restricted return pipe that bleeds off the excess pressure (and hence some fuel) back to the fuel tank. The simplest system is a low-pressure pump with no other components required. At least one Cob owner suffered all sorts of fuelling issues due to a faulty regulator causing a WOT lean out so be warned! 4.Heat insulator. Trying to start the engine whilst it’s still hot can be a problem due to the fuel boiling in the float bowls, I have actually seen this happening and it’s quite alarming! The cure is to fit and insulator between the carb and the manifold. You will need longer studs which are sometimes supplied as part of the kit. Be aware that you might require an ‘extra’ long stud or bolt if one of the studs is also being used to hold the throttle bracket. The photo below shows such an insulator, its made of 2 metal plates with multiple layers of insulating gaskets. 5.An extra throttle return spring. The spring fitted to the carb is not strong enough to do the required job, end of story! You must fit at least one extra spring to help close the throttle. You will need to fabricate a bracket to do this. Make sure that the extra spring(s) do not foul any part of the carb. Do not make the bracket out of weak aluminium or a piece of steel from old an baked bean tin, think about what will happen if the throttle sticks open! 6.The choke mechanism. This is not normally required and the use of it is likely to foul the plugs. You can remove the choke plate to aid the gas flow slightly. (Remove the small link rod as well otherwise it will fall into the engine and damage it!) The remaining mechanism can than be fixed with lock wire in the off position. A better solution is to use a stiff single strand choke wire and knob so that the fast idle part of the choke can still be used. The choke knob can be mounted off a bracket that is fixed to the car using one of the steering column bolts. This way the knob is hidden out of view. The fast idle screw can then be adjusted to bring up the idle speed to around 1200 RPM when the engine is cold to avoid it stalling. To start the engine without the choke just pump the throttle two or three times to squirt some fuel into the manifold before cranking the engine on the starter. When the engine ‘catches’ just gently pump the throttle so that the accelerator pump can supply the fuel to keep the engine running. After about 30 seconds the engine should run on the fast idle. After a few minutes the fast idle can be switched off. 7.A positive throttle stop. You will end up damaging the carburettor or snapping the throttle cable if you do not make some sort of stopper for the throttle pedal. It needs to be setup so that when the pedal is hard against the stop the carb is just about fully open but the cable is not as tight as a ‘bow string’. If you just ‘plonk’ the carburettor on to the manifold and turn the key the engine will fire up and it will appear to run just fine. This does not mean that things really are just fine. The RV8 will tolerate a very rich mixture without showing any bad signs other than black plugs and a smelly exhaust. What is actually happening is that all the oil is being washed off the cylinder bores, the rings and the bores then start to wear out. It does not take a lot of miles for this to happen either! I have worked on several 3.5 engines, one 3.9 engine and one 4.6 engine, they all seem to respond to the carburettor in a similar way. Many other people have confirmed my findings which are that the carburettor's stock settings are far too rich on the cruise setting (i.e small throttle openings). They all run slightly lean when accelerating hard and when running at max revs and WOT. By slightly lean, I mean very slightly lean, not enough to harm the engine. The too rich setting is very bad and will cause the damaged described above. It's quite surprising that so many different engines respond to the carburettor in the same way as things like the exhaust, air filter and camshaft will all have an effect and they were all different with each engine. I guess that if you were tuning the carb to the ‘Nth’ degree then the settings would be different for each engine. I have only seen one engine that was NOT too rich on the stock settings, that was a 5.0L running with JE heads, Offenhauser Dual Port manifold, and with a Crower cam (details not known). I don't think that it is a simple as saying the carb is OK with the stock settings on big engines. It is just as likely that the extra vacuum that a big engine will generate will cause even more fuel to be discharged into the air-stream. It helps if you have a basic understanding of how the carburettor works, the PDF document explains all this in great detail but in brief it works as described below. 1. At tickover and at very, very small throttle openings regardless of the revs is controlled by the two mixture screws at the front of the carb. How these interact with each other depends on the type of manifold that you have fitted. (A 180 or a 360 manifold). Screwing them in leans off the AFR. 2.The AFR at cruise is controlled by the primary jets and the thick part of the metering rods. The rods have a part number but they also have a size number, for example the standard rod is a 65-52. The numbers are the diameter of the rod in thou-of-an-inch. (There are two numbers as the rod is stepped and therefore has two diameters). The standard primary jet is an 86, this is just the diameter in thou. 3.The acceleration circuit or power mode is controlled by a number of things; during moderate acceleration the AFR is controlled by the primary jet and the thin part of the rod. The rods will lift due to a low manifold vacuum, when this happens is controlled by the springs that sit under the pistons that are connected to the rods. 4.At high revs and large throttle openings along with WOT the AFR is controlled by the secondary jets and to a small degree the primaries and the thin part of the rods. (There is always an overlap between the carburettors ‘circuits’). So what do the rods do? The rods have two diameters and they are connected to small pistons that have springs under them. Each piston is in a cylinder that is connected to the manifold so that it is subjected manifold vacuum. At small throttle openings the vacuum is high and this pulls down the pistons and thus the rod down. The result is that the thick ‘cruise’ part of the rod goes through the middle of the primary jet and partially blocks the jet, this leans off the mixture. The area for the fuel to flow through is a ring shape formed by the jet with the rod poking through the middle of it. When you open up the throttle the vacuum in the manifold drops, this allows the springs under the pistons to push the pistons and thus the rods up. The result is that the thinner, power mode part of the rod is now poking through the middle of the jet, the AFR becomes richer, which is what is required during the acceleration phase of the car. Different strength springs are available to control when the rod is in the up or down position. (The orange springs are standard). Knowing how the rods function means that we can compare any set of jets and rods combination with any other set to see what the AFR will be. It is quite possible to fit a smaller jet and end up with a richer AFR if at the same time a much thinner rod is fitted. Using some simple maths it can all be worked out. (Using Area = PI X R X R) R being the radius of the rod or jet, PI being 3.14. The standard setup for the carb is an 86 jet and a 65-52 rod. The area of the 86 jet is therefore 5808 thou-of-an-inch squared. Or 0.0058 of an inch squared. The area of the cruise part of 65-52 rod (65) is 0.0033 of an inch squared. The area of the power mode of the 65-52 rod (52) is 0.0021 of an inch squared. These are our base settings; any other settings can be compared to them. This works out to be 8.3% leaner on cruise and 6.8% leaner in the power mode when compared to the stock, base settings. Another example would be an 83 jet and a 62-52 rod. This works out to be 3.9% leaner on cruise and 10.8% leaner in the power mode compared to the stock, base settings. Remember that the base settings are too rich in cruise mode and OK to slightly lean in the power mode! According to Des Hammills book on tuning Rover V8 engines the following AFR figures are what is needed to achieve clean running and maximum BHP. I must say that I have not managed to lean off the cruise setting to the figure given above without the response of the engine becoming very poor. Also my engine runs slightly better at 13:1 at idle rather than the 13.5:1 that Des recommends. I have witnessed a standard 3.5 engine that was happy to run at 41.7:1 at idle so I guess that above figures will varry depending on the state of tune of the engine. (My 4.6 is running stage III heads with a RPI/Piper Stealth Max 285 cam). The tickover or idle setting is the easiest to adjust, the engine needs to be up to temperature in order to make this adjustment. The ‘correct’ way to set the AFR would be to use an exhaust gas analyser in one form or another however the screws can be setup very well just by ‘ear’. The first part of the procedure is to set both the screws up to a setting that is too rich for the engine, but not so rich that it won’t run. From fully screwed in the screws will need to be screwed back out 2.5 to 4 turns out. Basically with the engine running gradually turn each screw out until the tickover speed just starts to drop slightly. This is the too rich setting. Still with the engine running you will now need to slowly turn each screw back in, one at a time. At the same time you must very carefully listen to the engine speed, it will possibly speed up slightly as the mixture leans off and the ratio get nearer to what is required. Keep turning just one of the screws in until the engine JUST starts to slow down. It will be a very slight drop in RPM so you will need to listen carefully. (The ‘bark’ in the exhaust note will also just start to drop off). At this point stop turning the screw in, turn it back out ¼ of a turn. You now need to carry out the procedure with the other screw. This method will get your CO setting to around 2-2.5%, which is pretty clean. You can now switch the engine off and then screw each screw fully in whilst counting the turns. Make a note of this setting then re-set the screws, you should find that they are around 1 ¾ to 2 ¼. If the screws are out around 3 ½ turns then you either have a radical cam fitted or you might have a problem that is causing a lack of vacuum in the carb. This could be a simple leak or it could be worn out piston rings! Note that the above method of adjusting each screw one at a time works because a 180 manifold basically cuts the carb in half, one primary venturi feeds the two outer cylinders on one cylinder bank AND the two inner cylinders on the other cylinder bank. Therefore when you’re adjusting the screw 4 cylinders are being affected and this is enough to cause changes in the idle speed RPM. A true single plane or 360 manifold is one where all the venturies of the carb feed a single chamber, the inlet runners all connect to this chamber. The dual port manifold is not quite like this BUT both primary venturies ARE connected to all the cylinders. The setup for this type of manifold is very similar to the method described above for the 180 manifold but the one big difference is that you cannot set each screw up one at a time. If you do try to do it this way one screw will be set very lean (virtually closed) whilst the other will be quite rich. The overall result may well be the correct AFR in the chamber below the carb but it is not really the way to go. The screws need to be turned at the same time or at least very nearly at the same time. To find the rich setting turn one screw out 1/8 of a turn then to the same with the other. Keep switching from one screw to the other turning the screws out until the AFR goes too rich and the RPM starts to drop. This is now the rich point setting. Now each screw needs turning in 1/8 of a turn at a time, the motor may pick up a little but at some point it will slow down. Open each screw back out ¼ of a turn. Kill the engine and make a note of the settings as described above. Note that the adjustment was carried out in 1/8th turns, not ¼ or ½ turns! The reason for this is that the screw threads are quite course. The AFR will go from too lean to too rich within ½ to ¾ of a turn of the screws. I’ve seen this happen via a lambda probe. The Edelbrock PDF states that you should lean of the cruise mode to the point where the engine responds badly, and then you go one stage richer. This method works very well and is also easy to achieve by ‘seat of the pants’ road testing. The bad response that you are feeling for is poor throttle response at SMALL throttle openings, e.g. the mount of throttle required to drive at 30-50 MPH. Believe me you will know when you’ve gone too lean! My tests (and other peoples) have shown that once you get to 10% leaner than the base settings you have gone too far. Therefore the next richest setting is about 8-9% leaner than the base setting. Any richer than this is getting towards too rich according to the Edelbrock PDF. This setting is quite hard to set by just driving the car. Having something like an Innovate LC1 lambda probe really helps here as you can see what is going on with the AFR as you drive the car. Without such a device or a rolling road you really do not have any choice other than to believe me when I say that you do not really want to lean off this setting too much if at all from the standard base setting. Remember this setting is controlled by the size of the ‘ring’ that is formed by the primary jet and the thin part of the rod. The spring that sits under the piston controls when the carb is in this mode. I must say that I have not noticed much difference when changing the spring but I have not spent a long time testing different springs. This setting is also hard to set just by driving on the road, again an LC1 will really help here. To adjust the AFR at WOT the secondary jets should be changed. The standard jets in the 500 carb are 95’s. I have found that the AFR at WOT is not very sensitive to a change in the size of these jets therefore you might have to increase their size by quite a large amount before the LC1 shows a change in the AFR. In fact it is possible to use jets that are ment to be used in the larger Edelbrock carburettors as the secondaries in the 500 carb. (There is no difference in design between the primary a secondary jets). The idea of the pump is to richen up the mixture for a second or two when you boot the throttle right to the floor. All you can do is test how the engine responds with the pump arm in each of the three holes. You could also extend the arm via a bolt on extension if you suspect that the mixture is going far to rich. 86 primaries, 67-55 rods, 95 secondaries, Orange piston springs. This setting is the leanest cruise that will work but unfortunately the power mode is also leaned off a few percent. It is the easiest and cheapest setting to achieve as only a pair of rods needs to be purchased. 83 primaries, 62-47 rods, 95 secondaries, Orange piston springs. This setting does not run the cruise quite as lean as it could be run but is still much leaner than the base setup. The power mode is virtually unchanged from the base setting. This setup does require that you fit a new set of jets and rods therefore it might take you 15 minutes to recalibrate the carb. 86 primaries, 67-52 rods, 104 secondaries, silver piston springs. This is the setting that I run my 4.6 stage III on (The settings at the time of writing). The cruise is as lean as I have found I can go. The power mode is as rich as standard as far as the primary circuit is concerned. The WOT and very hard acceleration is richened up due to the 104 secondary jets. The silver piston springs also bring into play the thinner part of the rods slightly earlier as they are one stage stronger than the orange springs. Please note that you cannot buy a pair of 67-52 rods, I modified a pair of rods to create this one off pair! The image below shows the one-off rods that I made by modifying a set of 68-52 rods, a small brass sleeve has been used along with solder to join the two parts of the rod back together. Note that only 1 thou of an inch was removed from the cruise part of the rod but that is a difference of 5.2% AFR on cruise. The rods are very accurately made so you need a good micrometer to measure the diameters, I have a digital micrometer that reads 2 thou too large and that is enough to mess things up! The micrometer in the image is old but spot on! As far as I can tell the Edelbrock calibration chart has several errors in it with regards to the percentage changes that certain jet and rod combinations will give you. For example the 83 jet 62-52 rod is shown as point 5 on the chart, (page 10 of the PDF) this is 8% leaner in the power mode. If you do the maths (which was done above) this setup is nearly 11% leaner in the power mode! The 86 jet 67-55 rod is shown as point 6 on the chart, this is shown as 4% leaner in both modes but the maths above shows it to be 8.3% leaner on cruise and 6.8% leaner in the power mode! Another perfectly good jet and rod combination is just not shown at all! (The 83 primaries, 62-47 rods). Do not fit a glass or plastic fuel filter in the engine bay, if it breaks or leaks your car could go up in flames. However you really must run a filter in the fuel system somewhere otherwise you will end up with crud in the carburettor. Do not expect a massive gain in BHP after re-calibrating the carburettor, there maybe a small increase in BHP as a result but the main aim is to supply the engine with the correct AFR for all operating conditions. This will ensure that the bores last a long time and that the engine does not run too hot due to a weak mixture. Your MPG will, however increase which is nice!